IMF Agent Ethan Hunt (Tom Cruise) and long-time associates Luther (Ving Rhames) and Benji (Simon Pegg) are on the trail of the Syndicate, a rogue anarchist network of former spies. When their op goes awry, Ethan and his team must race to avert catastrophe. So far, so Mission: Impossible. Yet in this sixth instalment, writer-director Christopher McQuarrie has elevated the formula to its highest possible point. Not only is Fallout the best Mission: Impossible film by a considerable margin, it is also undoubtedly the best action film of the year. The long-running series has generally been received warmly by audiences and critics, but has rarely inspired the high praise or devotion that, say, the best of the Bourne or the Bond franchises inspire. Yet with this entry, McQuarrie has made Mission: Impossible the action series to beat. Although six films in, Fallout is the only one to entice a director to make a second entry – here McQuarrie returning from the last M:I film, Rogue Nation. Each of the prior films brought with them their own directors and visions – the dark Euro-spy intrigue of Brian de Palma’s first entry, or the colourful, cartoony fun of Brad Bird’s Ghost Protocol, for example. Having directed two films in the franchise, McQuarrie breaks somewhat of a tradition, but also deepens the series’ mythology while polishing the new film’s style to a burnished finish. 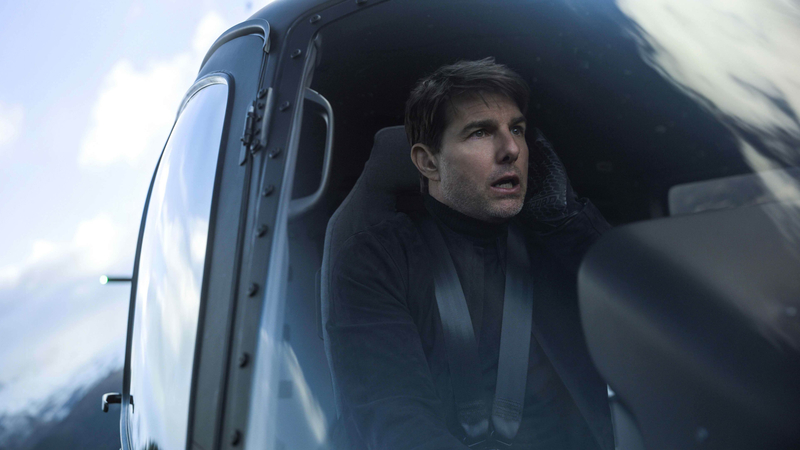 Mission: Impossible is unlikely to ever be accused of having characters with psychological depth, but several dream sequences do provide Hunt with a modicum of interiority. It certainly goes some way to explaining his (and by proxy, Cruise’s) demented pursuit of exponentially outrageous stunts. And what stunts Cruise gifts us here – easily the most elaborate, lengthy and death-defying of all six films. The HALO jump is worth the admission price alone, made all the more astonishing that it really is Cruise falling through the sky. The camera going in and out of focus is less a stylistic flourish and more a result of the cameraman heroically wrangling with a head-mounted rig as they plummet to the ground. The visuals, even in the film’s more sedate moments, are the best the series has ever seen. Solo’s controversial low lighting is brought to mind with Rob Hardy’s noirish, moody cinematography, yet the darkness perfectly suits this material, introducing a sense of intrigue that has been absent from the series since de Palma’s twisty-turny original. Fallout is, as ever, Cruise’s show, but his supporting cast admirably round the film out, both with affectionate, often humorous turns from Rhames and Pegg, Alec Baldwin’s returning IMF secretary and Angela Bassett’s tough CIA director. Finishing the cast is Henry Cavill’s Agent Walker, a lunk with about as much charm as his infamous moustache, his oaken, Schwarzenegger-esque physicality contrasted with Cruise’s wiry frame. If there are any weak links it is, invariably in the women characters – more or less pushed to the sidelines as tropey femme fatales and plot devices. Ilsa Faust (Rebecca Ferguson) proves the exception here as the MI6 agent from Rogue Nation with an agenda of her own – though even she feels a little underused. Nevertheless, the whole machine is so finely tuned that these quibbles barely register as flaws. A film like Mission: Impossible will never be considered high cinema, and nor does it need to be. But as the best possible version of itself, Fallout is essentially perfect.